On the morning of February 6th, 1997, two Stockton Firefighters gave their lives while battling a structure fire on Mendocino Avenue. 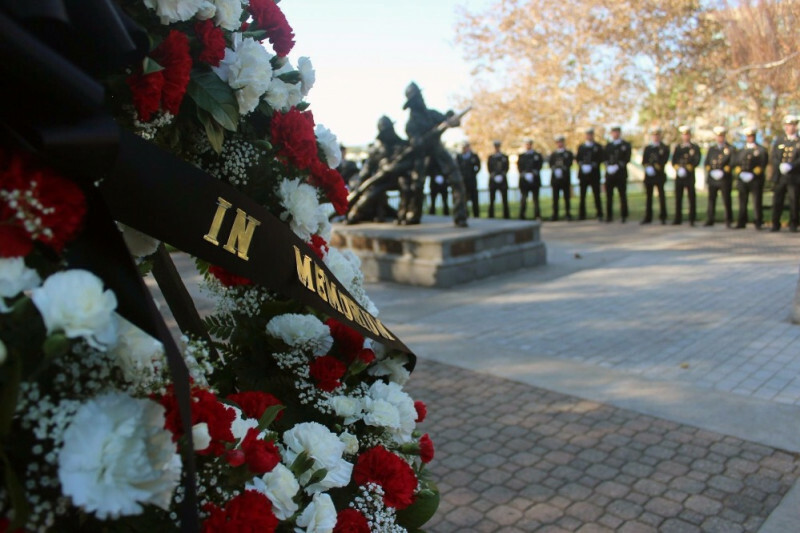 In loving memory of Firefighters Brett Alan Laws and Bryan Jacob Golden; Stockton Firefighters organized an effort to raise a memorial honoring all who have made the ultimate sacrifice in the Stockton Fire Department. After a rigorous selection and construction process, The Fallen Firefighters Monument was installed in the heart of downtown Stockton. Now, 20 years later, the Monument has suffered repeated graffiti and desecration. The initial design of the Monument was intended for people to be able to touch- to grieve and process in their own ways; Now it has become a regular target for those without respect for such things. Tagged. Engraved memorial plates pried off and stolen for scrap money. Brazen attacks on it for seemingly no reason other than it was something to beat upon. Stockton Firefighters are heartbroken and were required to erect a fence around this public memorial to protect it. Now we were required to removed the Monument off the pedestal, in order to save it from further desecration. Our Monument is a cultural center-point for our department, signifying brotherhood and sacrifice. We utilize the location frequently- for promotional ceremonies, public remembrances, and private observances. We are heartbroken that we can no longer share this beloved symbol with the public. It means too much to us to be disfigured in this way. We must protect it until we can display it again soon. Our goal is create a new pedestal for the Monument- something with several deterrents. Lighted. Raised. Surrounded by fence. We're not sure. Our remodel is in it's design phase, and we hope to return the Monument to the public as soon as we can. But it is not easy. And it is not free. If you believe in the sacrifice of those who have Fallen. If you want to see an honorable symbol of our values, displayed in public. Our pride, tradition, and service. And if you have the ability to give... please do. The Stockton Firefighters Relief Association is a 501c3 non-profit responsible for the Monument and it's care. Every donation will be specifically used to return this Monument to the public, and continue it's care in the future. We thank you with all of our hearts. We are proud to serve the citizens and City of Stockton, California. We will return this beautiful Monument as soon as we can. Please consider donating to this cause if you are able. This monument is a cultural pillar of our fire department. We hope to give it a new home soon- one that is worthy of it's beauty and honor.